Unilever IdeaTrophy 2012 is a creative & challenging experience to give University students the opportunity to express their unique business ideas, be developed by professional business mentors and get a taste of after-school life. Unilever IdeaTrophy is a challenging and creative experience, where you will figure out how business works in real life while developing your skills and competencies. Every year, a leading Unilever brand or function is selected as the sole focus of IdeaTrophy. The challenge started in two thousand eleven (2011) with Axe Deodorant. 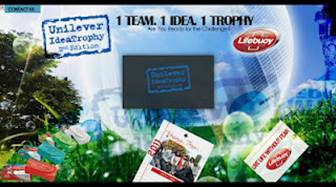 And now it’s time to play the biggest game in history with Lifebuoy! IdeaTrophy is not a simulation but hundred percent (100%) RCF (Real/Cool/Fun) business experience. So we advise you to challenge yourself before you start your own career! It’s definitely not a game! It’s too real to be a game! • To participate in the competition, University undergraduates need to form a team of three people*. • Each team will be required to submit a proposal based on the business challenge proposed by Unilever Nigeria. Visit www.ideatrophynigeria.com to download the challenge brief. Do you know Spotify now has more than 50 million paid subscribers?